So it all started with cake decorating…. what would stick. She simply observed the turnouts and silently gathered feedback. 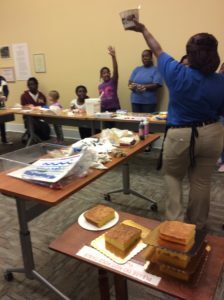 But when the cake decorating program took place, the normally sleepy little library was overrun with customers of all ages, clamoring for a chance to decorate cakes with Ms. Owens, our guest baker from the IGA grocery store. And thus began St. Stephen Library’s obsession with cooking programs. And they have more cooking programs that will be featured in their upcoming Cooking Academy series. Cookie decorating, sushi (nothing raw! ), and a Downton Abbey style “high tea” are on the menu this winter. 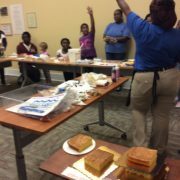 Many attendees travel distances to attend the cooking programs at St. Stephen, and many library staff and family members are also fans. Mrs. Owens from IGA grocery store gives cake decorating tips at the library. This program attracted attendees of all ages. Food and cooking are social events; they bring people together, in more ways than one. Learning about other cultures through food and cooking is a wonderful bonus. 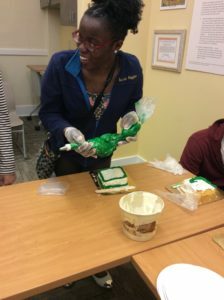 Furthermore, in rural areas, poor diet, obesity, and diet-related illnesses, such as diabetes, are extremely prevalent, and the library seeks to inform as well as entertain attendees at cooking programs. With all of the artificial and potentially harmful ingredients in food these days, we could all stand to be more cooking literate and aware of what goes into our dishes. So come and learn how to prepare healthy and delicious food at your library, through cooking programs as well as a great selection of cookbooks.